Karl Robinson believes this is the beginning of one of the most important weeks in MK Dons’ history. While working behind the scenes to improve his rapidly diminishing squad, Robinson’s Dons side face two vitally important games. On Tuesday night, they face Northampton Town in an FA Cup third round replay where the winner of which will play host to Premier League champions Chelsea - a guaranteed money spinner. And on Saturday, Dons travel to the Championship’s bottom club Bolton Wanderers in a bid to move 12 points clear of Neil Lennon’s side in their own bid to stay out of the relegation dog fight. Having come off the back of a comprehensive 5-0 defeat to Burnley last Tuesday night, Dons bounced back in fine style on Saturday, beating Reading 1-0. And if Dons can pick up two wins from their next two matches, the horizon will look significantly brighter than it did a week ago. Robinson said: “If we’re sat here in seven days time, and we’re in the fourth round, and we’ve beaten Bolton, with Chelsea coming up, that’ll top everything we’ve done. The next two games will need more detailed preparation than I’ve ever given. “We need to understand the importance of this. “We’re not looking beyond Northampton yet. Every game we go into we want to win. We know what the prize is, but Saturday looks set to be our biggest game of the season away at Bolton. If we beat them, we move 12 points away from bottom. 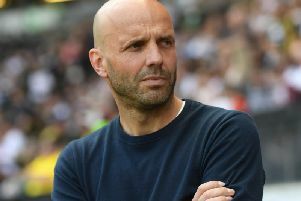 Robinson used the Berks & Bucks Senior Cup recently to give vital minutes to his second-string players in anticipation the busy schedule of late, and he believes the replay against League 2 Northampton will give him another opportunity to give those same players a chance to get a run out, while still taking the competition seriously. “There will probably be five changes, and four are forced,” said Robinson. “Joe Walsh can’t play three games in a week just yet. “But we aren’t playing a weakened team - our team is very strong. “It’s important we get ourselves up for it because the prize at the end of it is a phenomenal game against Chelsea. It’ll be around 30,000 for that. “People expected me to be down after the Northampton, but we saw it as a good opportunity to get some other players back out on the pitch.